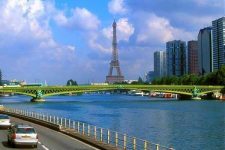 A virtual travel to the capital of France, which you can make with the help of the best live webcams in Paris, will allow you to see in real time the most famous sights of this city and will give you a great mood. 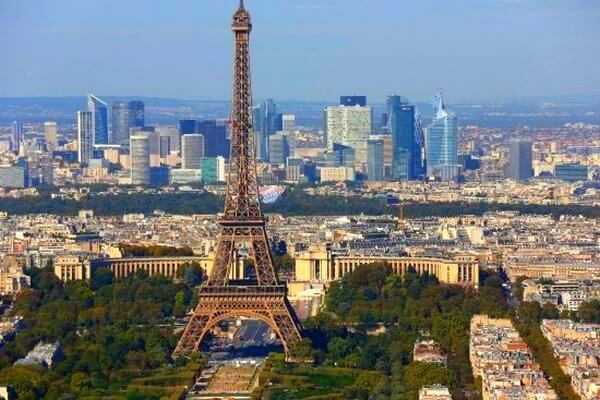 Paris is on the third place among all cities of the world in terms of the number of foreign tourists. For example, in 2017, more than 16 million foreigners visited the capital of France and saw the famous sights of this city. But it’s no secret that with the help of live webcams in Paris, this city was able to see online many more people from all over the world who could not visit the city personally or miss Paris, once having visited it. Paris is the largest city in the European Union by population, which without large suburbs of about 2.2 million people, and with the suburbs – more than 10 million inhabitants. A feature of the city is the almost complete absence of skyscrapers. Only the tower Montparnasse (which was built in 1975 and which can be seen with the help of one of the webcams of Paris) exceeds the height of 150 meters. Therefore, it is not surprising that the city’s territory, even with a population of 2 million, is very large. 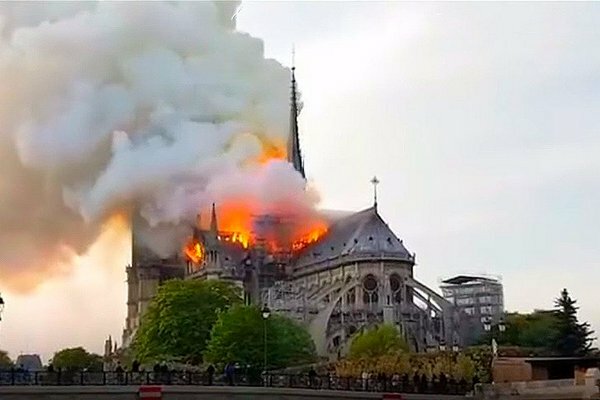 This is especially noticeable with the help of webcams in Paris in real time, which providing a panoramic view of this French metropolis. The River Seine, on which Paris is located, also contributes to the fact that the city’s territory becomes larger. But it is the Seine and the numerous bridges across this river that make Paris so picturesque and romantic. And many of the sights of the capital, which can be seen with the help of the best live webcams in Paris, are located just on the banks of this river (the Eiffel Tower, the Louvre, the Notre Dame Cathedral, the Invalides’ House, etc.). Also one of the features of the city is its small industrialization. The almost complete absence of industrial buildings (factories, plants) in the city, which were long ago taken outside Paris, positively affects the ecological situation in the capital, although the problem of gas contamination and noise from urban transport is still relevant. Despite the centuries-old history, even the historical center of the city does not seem too old and chaotic, as in a number of other ancient cities. With the help of many webcams in Paris, you can see that the city is dominated by typical buildings and veru long streets and avenues, very wide and straight. This fact is explained very simply: in the middle of the 19th century the old city blocks, which were real labyrinths of narrow streets and dilapidated wooden houses, were demolished and replaced in their place by a modern city of stone buildings in neoclassical style resembling real palace buildings or mansions with courtyard. And on the wide Parisian avenues there is room not only for cars and sidewalks, but also for green areas with numerous trees and flower beds. Perhaps, that is why Paris is such a harmonious and romantic city. By the way, the basic principles of urban development, adopted in the mid-19th century, are still relevant. Therefore, the size and height of new buildings are still subject to a uniform law of uniformity and Paris does not grow up. And many even the most modern hotels in Paris have an external resemblance to the classical residential and administrative buildings of the city. By the way, Paris is among the European cities with very expensive hotels. Therefore, experienced travelers are much more likely to stay in comfortable urban apartments of local residents, which are easy to find and book through AirBNB. By clicking on this link, you can get a special registration bonus of € 30, with which you can pay at least one night in Paris. Most of the webcams in Paris in real time have no restrictions in work, i.e. they broadcast around the clock from the capital of France. Despite this, the best time to make a virtual trip to Paris using webcams is the bright time of the day, when you can see the maximum details and see not only the objects that are located near the web camera, but also objects at a great distance. But since Paris is a modern metropolis in one of the most developed countries of Western Europe, there is nothing surprising in that it is interesting to look at the city even at night, because Paris never sleeps. Most of the city’s attractions have a modern artificial illumination, which in the evening and even at night allows you to see the main architectural features. A special illumination, which is included on the Eiffel Tower shortly before midnight, makes this time one of the most interesting for viewing live webcams in Paris, through which we can see the Eiffel Tower in real time from several parts of the city. Also with the help of night lighting you can see and appreciate the length of Parisian streets, urban traffic at night and in general the territory of the city and its suburbs, which also glow in the dark. Almost all webcams in Paris broadcast live video from the capital of France in high definition mode (HD). Therefore, for many, it is the online city webcams that are the source of real-time weather data in Paris. After all, it’s better to see the weather conditions in one or another district of Paris once than to read about it on the Internet or to listen on the radio. With the help of online webcams in Paris, you can see in real time the weather in the city and its immediate suburbs with your own eyes: whether the sun is shining, whether it is raining or snowing, the presence of thunderclouds, the strength and direction of the wind, etc. Unfortunately, in the winter months in the capital of France there is a thick fog. In this period, with the help of even the best Paris webcams you will see a little. By tradition, all webcams in Paris are located on separate pages of the site. You can immediately open the most interesting webcam for you by using the list on this page. In the list you will find the name of the webcams, their short description and the link to go to the viewing. And already directly on the webcam page you can see Paris online and (if desired) get more information about the location of the webcam in the city and the objects in Paris, which can be seen with this webcam. And using the arrow above the webcam playback window, you can quickly jump to the next Paris webcam from the list. Enjoy watching! Webcam in the central part of Paris, with which we can see in real time the most important tourist attraction of the city – the Eiffel Tower. The huge metal structure erected in the distant 1889 quickly became the main symbol of Paris and all of France, although initially many residents of the city treated the tower negatively and demanded to dismantle it as soon as possible (in the opinion of the creative intelligentsia, the tower spoiled the appearance of the city). With this webcam you can see almost the entire Eiffel Tower, as well as the section of the River Seine with bridges to the left of the tower, the nearest city quarters and the majestic Sacré-Cœur basilica, which is at the highest point of the city – on the hill of Montmartre (in the background of this webcams of Paris). Since the Eiffel Tower is located in the central part of Paris, on the Champs de Mars. Webcam in Paris, which allows you to see in real time one of the main attractions of the city – the Arc de Triomphe. This majestic structure was built in the first half of the 19th century (1806-1836) by the design of Jean Schalgren. The main customer of the construction was the Emperor of France Napoleon Bonaparte, and the arch should symbolize and glorify the victories of the French army. Arc de Triomphe located in the 8th district of the city and it is much larger than many people think. The height of the Arc de Triomphe in Paris is 49.5 meters – it is more high than the typical 15-storey building. Therefore, it is not surprising that most of the neighboring houses in Paris are much lower. The width of the Arc de Triomphe is almost 45 meters, and the height of its central arch is almost 30 meters. 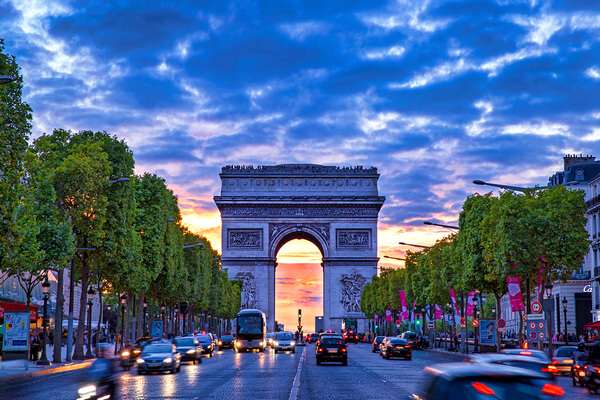 The triumphal arch stands in the central part of the round square of Charles de Gaulle, better known as the Square of the Star due to the large number of streets and avenues diverging in different directions. Another popular webcam in Paris overlooking one of the main attractions of this city. 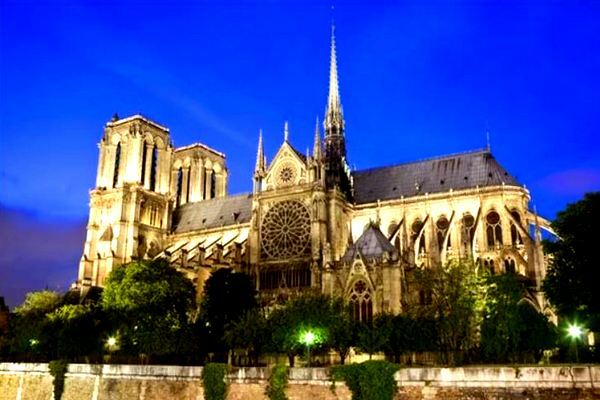 In general, there are a lot of world-famous sights in the capital of France, and it is almost always the case not about some small objects, but about grand buildings and structures. This webcam allows you to see in real time the Palais des Invalides (also known as Les Invalides) in Paris. Construction of the building was begun in 1670, and completed in 1677, which even by modern standards is a very short period for construction work of this magnitude. At the same time, the first inhabitants of the Palace of Invalides – veterans of the French army – settled in the rooms designated for this as early as 1674. 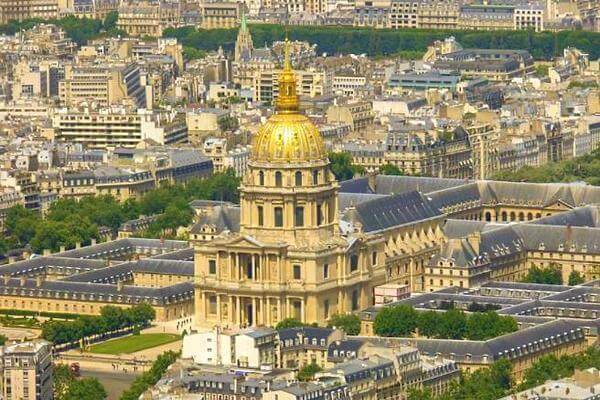 As we can see with the webcam, the Palace of Invalides consists of two parts – the cathedral and residential buildings. The grandiose cathedral in the foreground of this webcam of Paris is the Cathedral of Saint Louis, also called the Cathedral of the Invalides. A popular live webcam in Paris, which allows you to see the city’s main river in real time. Seine for the French is not just a river, but one of the main symbols of Paris and the whole country. On the banks of the Seine, there are numerous city sights, historical monuments and simply beautiful buildings that for centuries have inspired artists, writers and composers, and nowadays attract millions of tourists from all over the world to Paris. With the help of this webcam in Paris, we can see the Seine from the height of one of the high-rise buildings on the left bank of this river in the 15th arrondissement of Paris, as well as two automobile bridges across the Seine, one of which is located in the central part of the webcam, and the second – at a greater distance. During the floods in Paris with this webcam you can see the water level in the Seine in real time. The light green bridge, located in the foreground of the webcam, is called the Mirabeau Bridge (surname of famous French politician). Another live webcam, which is located in the 15th arrondissement of Paris. Like the webcam of Paris with a view of the Seine, this camera is installed on the facade of one of the modern high-rise buildings next to the Grenelle Bridge. At the same time, the main architectural objects that we can see in real time are the famous Radio House in Paris and the business district of Défense located far away. Between these objects is a very impressive distance, which exceeds five kilometers in a straight line. This means that with the help of this online webcam in Paris we can see the huge territory of the city, which includes almost the entire 16th arrondissement of Paris and, even, the famous Bois de Boulogne, which is located between this district and the district of Défense. The house of French Radio (La Maison de la Radio), which is located on the opposite bank of the Seine from this Paris webcam. 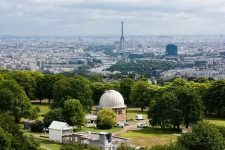 Web camera in the southern part of Paris, which allows you to see in real time a large territory of the French capital. The area in which the webcam is installed is called Montparnasse. If we talk about the administrative division of the city, then this is the 15th arrondissement of Paris. Like many other webcams in Paris, this one is located on the left bank of the Seine, where the Eiffel Tower, the Luxembourg Gardens, the Pantheon, the Latin Quarter and other attractions are located. The main dominant area that we can see with this real-time webcam in Paris is the Montparnasse tower. It is located on the left side of the webcam and can not be confused with other buildings, because this is the first of the constructed and the only full-fledged skyscraper that is located in the city of Paris. 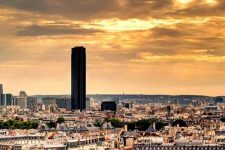 The Montparnasse Tower is a 210 meter tall skyscraper with a very laconic design. New webcam in Paris in real time, which allows you to see the panorama of the most modern district of Paris. 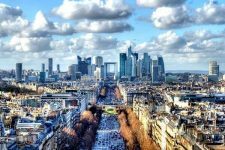 The development of the new district was begun back in 1955, and after 30 years, La Défense acquired its recognizable appearance and status as the main business district of Paris. La Defense is often called French Manhattan, and even with this camera you can understand the reason for this name. 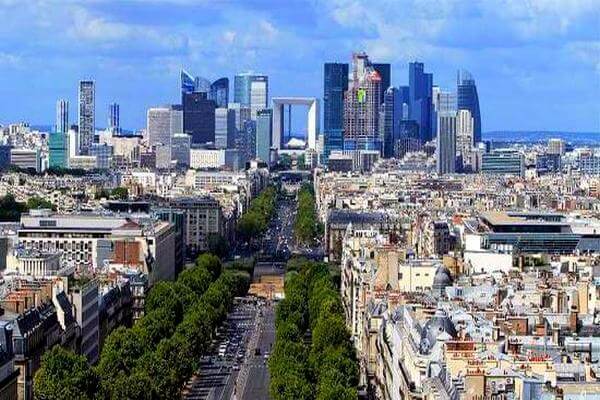 But unlike Manhattan, which is located in the center of New York, the Paris district of La Défense is located on the outskirts of the city, but this did not prevent it from becoming the largest business center in the whole of Europe. The main distinctive feature of the area is its functional purpose. La Defense consists entirely of office buildings and shopping centers. This webcam is located in the very center of Paris and allows you to see in real time Place de la Concorde, which is the largest square of the French capital and the second largest in this country. This live webcam in Paris allows you to see the northern part of Place de la Concorde, on the west side of which (to the left) are the Champs Elysees. On the east side, this square is bordered by a huge green area in the center of Paris – the Tuileries Garden. 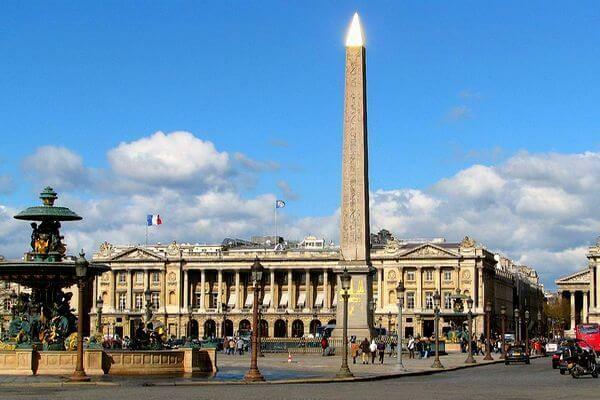 The Place de la Concorde in Paris repeatedly changed its name: at the time of the monarchy, it was called the Louis 15 square, and after the establishment of the republic – the Revolution square. The current name of the Square of Concord was received in 1795. The entire Concorde Square and the majestic buildings surrounding it are a monument of town planning of the era of classicism. P.S. In the near future on the page will be added new live webcams in Paris with a view of the city’s best attractions. Keep for updates.